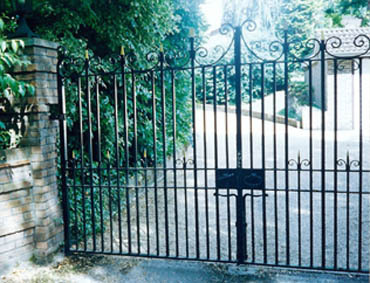 We undertake the manufacture of traditional, modern, or custom designed wrought iron gates and have undertaken projects in various locations including London, Surrey, Hampshire and Berkshire. We can discuss your requirements; agree the gate design and facilities, such as security/automatic control and decoration, we will then build and install the gate on an agreed date. 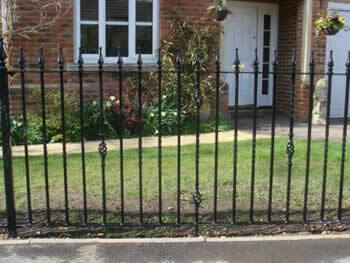 Our services cover decorative wrought iron gates and automatic electric gates. We can manufacture and install wrought iron railings solely or to match or complement existing or new wrought iron gates. Please visit the gallery to see examples of relevant commissions relating to wrought iron gates and railings in London and Surrey, and also Hampshire and Berkshire. Please contact our Surrey Office if you require any more information on these aspects of our work.